IBF # 1 heavyweight Kubrat Pulev, 18-0, will now face Joey Abell, 29-6, on Sauerland´s big show in Neubrandenburg on Saturday December 14. Abell steps in for Sherman "Tank" Williams who withdrew this weekend with injury. 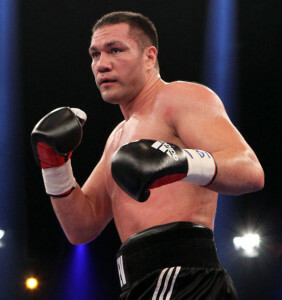 Abell, a tall southpaw, is completely different kind of fighter than the stocky Williams stylewise but Pulev (pictured) is confident of victory anyway. Off the bill is British heavyweight David Price, who is sidelined with a virus. Price was scheduled to face Russian giant Evgeny Orlov. The undercard features middleweight Dominik Britsch, 27-1-1, who is in against Spaniard Jose Yebes, 11-4-1. Supermiddle Tyron Zeuge, 10-0, who face Italian Alessio Furlan, 27-17-5 and finally lightheavy Enrico Koelling, 10-0. face Czech Tomas Adamek, 20-9-2. In the co-feature WBA I/C champ Jack Culcay, 15-1, defends the title against Frenchman Dieudonne Belinga, 11-3. Jurgen Braehmer and Marcus Oliveira headline in a fight for the WBA regular lightheavy title. Tuffing Sport in Stockholm, Sweden, stage a six-fight off TV show at the famed nightclub Gota Kallare in Stockholm on Saturday (Dec 14). Topping the bill is female jr middle Mikaela Lauren, who face Hungarian Rita Kennessey. Also on the bill jr middles Benjamin Kalinovic and Akilles Adnan, as well as comebacking welter Peter Semo and debuting jr welter Karsam Salim. P 3 Boxing in Finland and Stonehand Promotion from Norway join forces for a show at the Ringside Gym on Saturday in Espoo. Nikita Dubunin headline in his first fight for almost seven years. Dubunin, 6-0-1, drew with Frenchman Franck Haroche Horta in what now looks like fine result but was back then viewed as a setback. Dubunin´s stablemates Ken-Tor Hallan and Arne Ernstsen are also on the show. German cruiser Serdar Sahin is injured and off the fight against Pole Krzystof Glowacki on Saturday in Poland. Replacing Serdar is stablemate Varol Vekiloglu.